On a recent Called to Coach: Singapore Edition we spoke with Gallup-Certified Strengths Coach, Viya Chen. Viya started her own coaching company about 10 years ago, initiating her "second career" after decades in the corporate world. She wanted to help people discover their strengths and lead them to using those strengths to accomplish their lifelong goals. Viya believes that you must know yourself before you can identify what you want out of life, and the Clifton StrengthsFinder is the perfect tool in that regard. The assessment provides an avenue to knowing yourself intimately because it reveals the direct links between your talent, value and productivity. One of the reasons Viya became a strengths coach was to help her clients see how they can become the best versions of themselves. The Clifton StrengthsFinder helps her achieve this by revealing the uniqueness of each person who takes it. Fueled by the excitement and positivity of understanding what makes them unique, Viya’s clients see how they can use their strengths to be their very best. Viya believes that your best coach is your own intuition. In that way, she encourages her clients to follow the 4E process: Explore, Envision, Engage and Empower. She begins by helping clients Explore their strengths. Then she asks them to Envision their goals. After that, she asks them to Engage their minds, hearts and hands in the process of achieving their goals. Finally, Viya asks her clients to Empower the action they need to take to achieve their goals by using their strengths and listening to their intuition. Viya also helps other coaches become more successful by teaching them to know their SHAPE. Coaches must know and understand all 34 of their Strengths. They need to listen to their Hearts to understand their purpose and motivation for coaching. They must explore their Ability, including their skills, knowledge and attitude. Also, they must keep their Personality top of mind -- do they tend to enjoy coaching groups of people or conducting one-on-one sessions? Finally, coaches must have a firm understanding of their Experience in coaching others. Adhering to these five principles helps coaches achieve success. To hear more about Viya and her coaching experiences and expertise, watch the video above. Viya Chen is the first Gallup-Certified Strengths Coach listed in the Greater China region who offers coaching in Chinese and English. 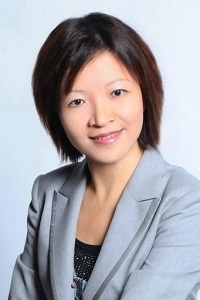 She is also the founder of VIABIZ Asia based in Singapore, and has associated offices in Shanghai, Beijing, and Taipei. Her passion in strengths business coaching is to enable people to embrace their talents for greater personal success and turn their dreams into reality. She worked in Vice President, General Manager, and Chief Executive roles, including at a Fortune Top 100 company in APMEA for 20+ years.